Fareed Zakaria is a veteran Putin conspiracy theorist. And you can assume he feels this obsession has helped further his career, especially at CNN. Russia expert Dominic Basulto summed it up as “what slick propaganda for the masses looks like in the digital era.” Further pointing out how Zakaria failed to disclose his own “Russian collusion” as a host at the 2016 St Petersburg Economic Forum. An appearance which didn’t go very well for the CNN anchor. Over the past couple of years, Zakaria has been one of the loudest voices pushing the “Trump/Russia” hoax. But, instead of accepting reality after Robert Mueller’s report kiboshed the yarn, he doubled down. And his latest video is unhinged. Dubbed ‘Fareed’s take,’ the segment’s blurb states “the real puzzle remains: Why has Trump been unwilling to confront Putin in any way on any issue? And will Venezuela be the moment when Trump finally ends his appeasement?” And note the use of the word “appeasement,” intended to ‘Chamberlain’ Trump. Anyway, let’s not beat around the bush, the clip is complete bulls**t. President Trump has confronted Putin on many issues and their relationship has been hyper-adversarial. In the real world, of course, not the fantasy-land of American network TV. He has withdrawn from the 1987 Intermediate-Range Nuclear Forces Treaty, citing Russian non-compliance – a charge the Kremlin rejects. Trump has accepted Montenegro into NATO and will probably add North Macedonia before his term is up. Both countries are in the Balkans, a traditional Russian sphere of influence. Under Trump, the US armed Ukraine with lethal weapons in 2017, a step his predecessor Barack Obama was reluctant to take. The US president expelled dozens of Russian diplomats last year in response to the alleged poisoning of a Russian spy, who defected to Britain. He also closed Russia’s consulate in Seattle (he’d already shuttered the San Francisco equivalent a year earlier). Russia has backed the government of Nicolas Maduro in Venezuela, which the Americans hope to remove. Just last week, Trump ‘ordered’ Russia to “get out” of Venezuela, despite the fact that they have been there under a treaty with Caracas. The Veto tracks the evolution of the propaganda campaign waged by Western media against Syria. From Baba Amr in Homs 2011/2012 until the modern day “propaganda construct” – the NATO-member-state funded White Helmets. It honours Russia and China’s vetoes that have consistently defended Syria’s sovereignty and territorial integrity in the UN. The Veto exposes the criminal intentions of Western media and it archives the progression of the propaganda war waged by the West against Syria. Syrians are writing the history of the Syrian conflict because Syria and her allies have courageously resisted the Imperialist machine. As Rafiq has said so eloquently “ we are the Veto” and we must use it against the Industrial Media Complex in the West. Syria’s history belongs to the Syrians and Syria’s final victory must ensure that Western media is never again given the power to destroy a nation, divide its people and promote international terrorism both military and economic. It was quite amazing to watch reports from Syria this week by US news channel CNN. American bombing of a remaining redoubt of the ISIS terror group near Baghouz on the border with Iraq was presented as some kind of heroic final onslaught against the terror group. The inversion of reality is a staggering case study in propaganda and “perception management” under the guise of “free media”. CNN broadcast on-the-ground reports from its correspondent Ben Wedeman in Syria’s Deir ez-Zor province. In the background were evident signs, according to the channel’s video footage, that the US air force was dropping white phosphorus incendiary munitions in support of the offensive against militants. Indiscriminate use of white phosphorus bombs is arguably a war crime. Yet the US media openly reported this as if it was a legitimate war operation in order to “defeat terrorism”. Nothing in the CNN reportage suggested anything illegal about the US military campaign. On the contrary, the events were presented as a valorous attempt to “defeat ISIS”. There are several reasons why this latest US military operation in eastern Syria is disturbing, not least because of mounting civilian deaths as a result of American air strikes. For a start, American military presence in Syria is a gross violation of international law. The US has no legal mandate to be in that country, operating their since 2015, either as ground forces or warplanes. Secondly, it is well-documented that Washington has been covertly funneling military aid to various anti-government militia, including terrorist groups like ISIS, in a bid to overthrow the Syrian government of President Bashar al Assad. This has been conducted as part of an eight-year covert war sponsored by Washington and its allies for illegal regime change against the sovereign government in Damascus. President Trump has given orders for US forces to withdraw from Syria. He says it’s time to bring “our boys” home. As if “our boys” have performed a noble duty there. The fact is American forces in Syria constitute a war crime. They shouldn’t even be there. So, belated US media reports of American forces bearing down on the remnants of ISIS in eastern Syria are, to say the least, a little anomalous, given the systematic support that Washington has been covertly plying to assorted jihadist terror groups for the purpose of regime change. That is an entirely criminal aggression against Syria. But the latest operation in eastern Syria is particularly hard to take. It has been the Syrian army along with Russian, Iranian and Hezbollah forces that largely liberated Syria from the scourge of foreign-backed Islamist terror groups. The war in Syria has been won against the US and its malign criminal partners, not, as American media would have us believe, due to Washington’s “heroic efforts”. Western news media have lately focused on a small pocket of ISIS hold-outs in eastern Syria as if the US is the liberator of the Arab country – a country which Washington and its NATO allies have infiltrated with jihadists for criminal regime change. CNN’s coverage this week was especially perverse. Ben Wedeman and his team were showing US military dropping banned white phosphorus incendiaries on civilian areas of eastern Syria in the name of “fighting terrorism”. CNN’s reportage was without the slightest hint that such military actions amount to gross war crimes. The entire US military presence in Syria is an even bigger violation of international law. The “normalization” of such violations and war crimes by the US media in real time is an illustration of how such supposed news channels are nothing but a propaganda arm for Washington’s imperialist warmongering. The banal normalization by US news media of what should be viewed as enormous war crimes is something to behold, if not to be nauseated by. American forces in Syria have killed thousands of civilians. Their latest operations to “liberate” the eastern region from jihadists that they infiltrated with in the first place has caused, this week alone, dozens of civilian deaths from US air strikes. This is a gruesome reminder of the horror that US air strikes inflicted on the Syrian city of Raqqa which was flattened in 2017 by American bombardment. The charnel house that Syria has been turned into is a direct consequence of American regime-change machinations. And yet US media report a microcosm of the horror in terms suggesting that the American forces are somehow liberators. How grotesque. Such an obscene distortion is partly why Washington is allowed to continue its criminal wars in other parts of the world. It is because of US media whitewashing war crimes in real time. And CNN has the shameless audacity to call its war propaganda “journalism”. CNN analyst claims Trump’s speech sounded like HITLER’s, but script was written by… PUTIN?! A CNN analyst and adviser at the Biden Institute has showcased her unmatched skill to roll all in one by comparing Donald Trump to Hitler for using a turn of phrase once shouted by Joe Biden and at the same time written by Putin. For Vinograd, this was clearly a message lifted straight from Mein Kampf. “His statement makes me sick, on a personal level, preserving your heritage, reclaiming our heritage, that sounds a lot like a certain leader that killed members of my family and about six million other Jews in the 1940s,” she said. It wasn’t long before her eyebrow-raising remarks caught the attention of social media users – who found some glaring problems with her logic. For starters, former vice president Joe Biden made a nearly verbatim declaration in 2011, when he told the Florida Democratic Party Convention that “it’s time to reclaim our heritage.” He yelled it, too – which seems like something Hitler might do. To add salt to the open hypocrisy wound, Vinograd is a former Obama administration official who currently serves as an adviser to the Biden Institute, a think tank named in honor of – yes, you guessed it – Joe Biden. Then, of course, there’s the inconvenient reality that Trump’s daughter converted to Orthodox Judaism in keeping with her husband’s Jewish faith. Others pointed out that the US Commission for the Preservation of America’s Heritage Abroad – a government agency that uses that scary Hitler word! – is chaired by an Orthodox Jew. Vinograd’s comments about Putin also didn’t quite add up, with Twitter pundits expressing regret that she had failed to elaborate on which parts of Trump’s speech were allegedly written by the Russian president. Twitter users were especially impressed by Vinograd’s lack of self-awareness, after she accused the president of “pretending that there are foreign people trying to influence our country in a way that just isn’t accurate.” Seconds later, she suggested Vladimir Putin wrote Trump’s speech. The televised train wreck also got two thumbs down from radio host and former CIA analyst Buck Sexton, who summed up his feelings about the segment with a perceptive observation. “CNN is a joke. Just not a funny one,” he mused. I walked out of the apartment to the nearest pharmacy, four blocks away, where I found plenty of aspirin, as well as acetaminophen (generic Tylenol) and ibuprofen (generic Advil), in a well-stocked pharmacy with a knowledgeable professional staff that would be the envy of any US drugstore. I purchased all three products, plus cough syrup and other over-the-counter medications, because I doubted that anyone in the United States would believe me if I couldn’t produce the medications in their packages. In fact, I myself wouldn’t have believed anyone who made such claims without being able to produce the proof, so intense and unrelenting has been the drumbeat of lies. When the Youth Orchestra of Venezuela gave a concert in New York in early 2016, before I moved to Caracas, I went there thinking, “Gee, I hope that the members of the orchestra are all well-dressed and well-fed.” Yes, of course they were all well-dressed and well-fed! When I mentioned this in a talk at the University of Vermont, a student told me that he’d had the same feeling when he was following the Pan American soccer championship. He wondered if the Venezuelan players would be able to play, because they’d be so weakened from lack of food. In fact, he said, the Venezuelan team played superbly, and went much further in the competition than expected, since Venezuela has historically been a baseball country, unlike its soccer-obsessed neighbors Brazil and Colombia. Hard as it may be for followers of the US media to believe, Venezuela is a country where people play sports, go to work, go to classes, go to the beach, go to restaurants and attend concerts. They publish and read newspapers of all political stripes, from right to center-right, to center, to center-left, to left. They produce and watch programs on television, on TV channels that are also of all political stripes. CNN was ridiculed recently (Redacted Tonight, 2/1/19) when it carried a report on Venezuela, “in the socialist utopia that now leaves virtually every stomach empty,” followed immediately with a cut to a demonstration by the right-wing opposition, where everybody appeared to be quite well-fed. But surely that’s because most of the anti-government demonstrators were upper-middle class, a viewer might think. The proletarians at pro-government demonstrations must be suffering severe hunger. Not if one consults photos of the massive pro-government demonstration on February 2, where people seemed to be doing pretty well. This is in spite of the Trump administration’s extreme economic squeeze on the country, reminiscent of the “make the economy scream” strategy used by the Nixon administration and the CIA against the democratic government of President Salvador Allende in Chile, as well as many other democratically elected governments. That demonstration showed considerable support for the government of President Nicolás Maduro and widespread rejection of Donald Trump’s choice for president of Venezuela, Juan Guaidó. Guaidó, who proclaimed himself to be president of the country and was recognized minutes later by Trump, even though a public opinion poll showed that 81 percent of Venezuelans had never heard of him, comes from the ultra-right faction in Venezuelan politics. The pro-Maduro demonstration suggested, not surprisingly, that Guaidó had failed to win much popular support outside the wealthy and upper-middle class. But Guaidó couldn’t even win support from many of them. The day before rival rallies February 2, Henrique Capriles, the leader of a less extreme right-wing faction, gave an interview to the AFP that appeared in Últimas Noticias (2/1/19), the most widely read newspaper in Venezuela. In it, Capriles said that most of the opposition had not supported Guaidó’s self-proclamation as president. That may explain the surprisingly weak turnout at Guaidó’s demonstration, held in the wealthiest district of Caracas, and obviously outshone by the pro-government demonstration on the city’s main boulevard. The New York Times did not show pictures of that pro-government demonstration, limiting itself to a claim by unnamed “experts” (2/2/19) that the pro-government demonstration was smaller than the anti-government one. If that was the best photo it could find, it was remarkably unimpressive compared to the photos in the left-wing papers CCS (2/2/19)…. A huge anti-government demonstration was supposed to make possible a coup d’état, a maneuver the CIA has used repeatedly—in Iran in 1953, Guatemala in 1954, Brazil in 1964 and many more, straight through to Honduras in 2009 and Ukraine in 2015. The turnout at the Trump administration’s demonstration was disappointing, and the coup d’état never occurred. The result is that Trump has expressed a sudden interest in getting food and medicine to Venezuelans (FAIR.org, 2/9/19). Trump, who let thousands die in Puerto Rico and put small children in cages on the Mexican border, seems to be an unlikely champion of humanitarian aid to Latin Americans, but the corporate media have straight-facedly pretended to believe it. Most have suppressed reports that the Red Cross and the UN are providing aid to Venezuela in cooperation with the Venezuelan government, and have protested against US “aid” that is obviously a political and military ploy. The corporate media have continued to peddle the Trump-as-humanitarian-champion line, even after it was revealed that a US plane was caught smuggling weapons into Venezuela, and even after Trump named Iran/Contra criminal Elliott Abrams to head up Venezuelan operations. Abrams was in charge of the State Department Human Rights Office during the 1980s, when weapons to US-backed terrorists in Nicaragua were shipped in US planes disguised as “humanitarian” relief. Canada’s CBC (2/15/19) at least had the honesty to acknowledge that it had been had in swallowing a lie from Secretary of State Mike Pompeo that the Venezuelan government had blockaded a bridge between Colombia and Venezuela to prevent aid shipments. The newly built bridge has not yet been opened: it has never been open, apparently because of hostile relations between the two countries, but the non-opening long predates the US government’s alleged food and medicine shipments. The absurdity of $20 million of US food and medicine aid to a country of 30 million, when US authorities have stolen $30 billion from Venezuela in oil revenue, and take $30 million every day, needs no comment. The campaign of disinformation and outright lies about Venezuela was kicked off in 2016 by the Financial Times. Ironically, it chose the 14th anniversary of the 2002 failed coup d’etat against President Hugo Chávez—April 11, 2016—to claim that Venezuela was in “chaos” and “civil war,” and that Venezuela was a “failed state.” As with the Time and CNBC reports, the Financial Times reporter was not in Venezuela, and there was no evidence in the report that he had ever been there. I asked right-wing friends in Venezuela whether they agreed with the Financial Times claims. “Well, no, of course not,” said one, stating the obvious, “there is no chaos and no civil war. But Venezuela is a failed state, since it has not been able to provide for all the medical needs of the population.” By that standard, every country in Latin America is a failed state, and obviously the United States too. The New York Times has run stories (5/15/16, 10/1/16) claiming that conditions in Venezuelan hospitals are horrendous. The reports enraged Colombians in New York, who have noted that a patient can die on the doorstep of a Colombian public hospital if the patient has no insurance. In Venezuela, in contrast, patients are treated for free. One Colombian resident in New York said that his mother had recently returned to Bogotá after several years in the United States, and had not had time to obtain medical insurance. She fell ill, and went to a public hospital. The hospital left her in the waiting room for four hours, then sent her to a second hospital. The second hospital did the same, leaving her for four hours and then sending her to a third hospital. The third hospital was preparing to send her to a fourth when she protested that she was bleeding internally and was feeling weak. “I’m sorry, Señora, if you don’t have medical insurance, no public hospital in this country will look at you,” said the woman at the desk. “Your only hope is to go to a private hospital, but be prepared to pay a great deal of money up front.” Luckily, she had a wealthy friend, who took her to a private hospital, and paid a great deal of money up front. Such conditions in Colombia and other neoliberal states go unmentioned in the US corporate media, which have treated the Colombian government, long a right-wing murder-squad regime, as a US ally (Extra!, 2/09). Well, OK, but are the reports of conditions in Venezuelan hospitals true or grossly exaggerated? “They are much better than they were ten years ago,” said a friend who works in a Caracas hospital. In fact, he said, ten years before, the hospital where he worked did not exist, and new hospitals are now being opened. One was dedicated recently in the town of El Furrial, and another was opened in El Vigia, as reported by the centrist newspaper Últimas Noticias (3/3/17, 4/27/18). The government has also greatly expanded others, like a burn center in Caracas and three new operating rooms at the hospital in Villa Cura. 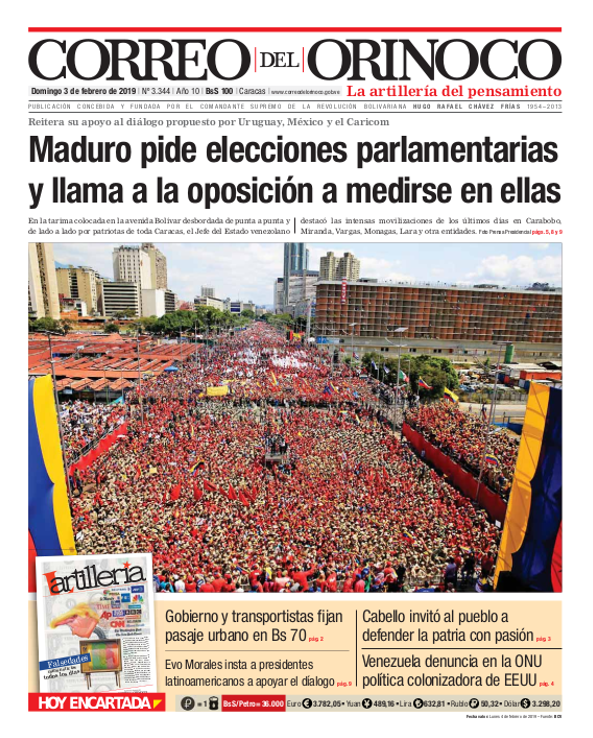 Meanwhile, the government is inaugurating a new high-speed train line, The Dream of Hugo Chávez, in March (Correo del Orinoco, 2/6/19). Since the US media have never allowed reporting on any accomplishments in the years since Chávez took office in 1999, but only any alleged, exaggerated or, as noted, completely invented shortcomings, readers have to consult an alternative history. Here is one offered by a Venezuelan on YouTube (3/31/11): “Por Culpa de Chávez” (“It’s Chávez’s Fault”). Depicting new hospitals, transit lines, housing, factories and so on built under Chavismo, it might help many understand why the Maduro government continues to enjoy such strong backing from so many people. This is not to minimize Venezuela’s problems. The country was hit, like other oil-producing countries, and as it was in the 1980s and ’90s, by the collapse of oil prices. That failed to bring down the government, so now the Trump administration has created an artificial crisis by using extreme economic warfare to deprive the country of foreign exchange needed to import basic necessities. The Trump measures seem designed to prevent any economic recovery. Like any country at war (and the Trump administration has placed Venezuela under wartime conditions, and is threatening immediate invasion), there have been shortages, and products that can mostly be found on the black market. This should surprise no one: During World War II in the US, a cornucopia of a country not seriously threatened with invasion, there was strict rationing of products like sugar, coffee and rubber. The Venezuelan government has made food, medicine and pharmaceuticals available at extremely low prices, but much of the merchandise has made its way to the black market, or over the border to Colombia, depriving Venezuelans of supplies and ruining Colombian producers. The government recently abandoned some of the heavy price subsidies, which resulted initially in higher prices. Over the past few weeks, prices have been coming down as supplies stayed in Venezuela, especially as the government gained greater control over the Colombian border to prevent smuggling. There has never been a serious discussion of any of this in the US corporate media, much less any discussion of the campaign of lies or the Trump administration warfare. There has been no comparison with conditions in the 1980s and ’90s, when Venezuela’s neoliberal government imposed IMF economic recipes, resulting in a popular rebellion, the bloody 1989 Caracazo, when wholesale government repression took the lives of hundreds (according to the government at the time) or thousands (according to government critics), and martial law took the lives of many more. Efforts by the right-wing opposition to provoke a similar uprising, and another Caracazo that could justify a foreign “humanitarian intervention,” have failed repeatedly. So the US administration and corporate media simply resort to the most extreme lying about Latin America that has been seen since the Reagan administration wars of the 1980s. Last August, an Associated Press investigative team found that the Saudi-led coalition had cut secret deals with Al Qaeda fighters, “paying some to leave key cities and towns and letting others retreat with weapons, equipment, and wads of looted cash.” Saudi-backed militias “actively recruit Al Qaeda militants,” the AP team added, “… because they’re considered exceptional fighters” and also supply them with armored trucks. Sergey Lavrov says he is opposed to retaliating against foreign media in Russia after the Facebook ban of Russia-linked pages. Moscow should instead focus on upholding the rights of its journalists abroad. The recent suspension of four Maffick Media Facebook pages after a CNN report on their links to RT is “definitely another example of pressure against Russian media and against free speech,” Russian Foreign Minister Sergey Lavrov told media after a meeting with his Slovak counterpart and current chairman of the Organization for Security and Cooperation in Europe (OSCE), Miroslav Lajcak. Lavrov said he had also brought to Lajcak’s attention recent cases of discrimination against Sputnik and RT, including journalists being arbitrarily banned from official events in Spain. When asked whether Moscow would retaliate against foreign media in Russia, however, Lavrov said he is “firmly against” such measures. The fact that we still have not done so is not only testimony to our restraint, but also to our strength. We are an open society. He pointed out that Ukrainian journalists are freely operating in Russia, including those reporting “rather aggressively” on both internal Russian events and Moscow’s relationships with the West. The authorities responsible for deciding on a response should not employ the “tooth for a tooth” principle, Lavrov said. “We should focus on maintaining comfortable working conditions for foreign journalists in Russia, while at the same time firmly defending the rights of our journalists abroad,” using the resources of international media rights institutions, the Russian foreign minister said. “Obviously, things will be getting only worse. Nobody even tries to believe in any freedom or talk about any freedom. This has already become an open geopolitical confrontation, where media platforms… serve as tools,” Simonyan said. The editor-in-chief of RT pointed out that Facebook had no complaints about the videos on the suspended pages or their content in general. “However, since CNN contacted [Facebook] and asked ‘how could you allow these Russians to communicate with our population,’ Facebook removed this account,” Simonyan said. CNN admitted it had been tipped off about Maffick Media’s funding by the Alliance for Securing Democracy, an advocacy group that is part of the German Marshall Fund (GMF) policy research centre. The fund considered an “undesirable organization” under the Russian law, receives some of its funding from the US and German governments, NATO and other organizations. According to CNN, the ASD does not receive financing from the GMF and is supported through private funds and grants, rather than by governments. Facebook said it would ask the three suspended accounts — Soapbox, Back Then and Waste-Ed — to submit information on their affiliations. “People connecting with Pages shouldn’t be misled about who’s behind them. Just as we’ve stepped up our enforcement of coordinated inauthentic behaviour and financially motivated spam over the past year, we’ll continue improving so people can get more information about the Pages they follow,” a Facebook spokesperson said in a statement, as quoted by RT. Moscow considers the blocking of Facebook pages related to RT unacceptable, adding that these authoritarian actions violate the principles of freedom of expression. Moreover, Russia is waiting for a response from “OSCE structures” to these actions, the Russian Foreign Ministry said in a statement. However, the social network has not, until now, required accounts to disclose information about their parent companies. Maffick remarked in its statement that plenty of media outlets supported in part by governments do not post information about their funding on their Facebook pages. Last week Facebook suspended pages of projects run by Maffick Media, an independent journalistic group that is partly owned by the Ruptly video agency, which is a subsidiary of RT. Facebook did not give Maffick Media any prior warning. According to Maffick’s statement, the social network was “pressured” into doing this by CNN, which ran a story on Maffick Media and its perceived ties to the Kremlin. US General Joseph L. Votel, who has presided over stagnant results in America’s wars since being named commander of US Central Command last year, recently publicly disagreed with US President Donald Trump’s decision to pull US troops from Syria. “It would not have been my military advice at that particular time,” Votel told CNN of the plan to withdraw troops. Of course, the advice of US generals has brought the country 18 years of war with nothing to show for it except the Pentagon’s expanded budget. The United States now spends about 40 percent more on the military per year than it did during the height of the Iraq War in 2005. “I would not have made that suggestion, frankly,” said Votel, referring to the decision to bring the troops back home to the US — a process that’s evidently ongoing and also a source of mystery. Exits are notoriously dangerous military maneuvers, so the US has kept quiet on the precise number of forces it has maintained across Syria, Iraq and Afghanistan. Some analysts have suggested that the military’s consistent refusal over the years to be transparent about troop numbers in the above-mentioned countries has backfired, leaving them with little evidence for their assertions that Trump is killing a critical mission. The US Constitution, of course, leaves final military decisions up to the president and not the generals, who are subordinate to the office. On Friday, Votel was back on the Pentagon’s message that Daesh is not actually defeated, even though the terrorists’ land holdings have been reduced from the size of Britain to less than a square mile. Daesh “still has leaders, still has fighters, it still has facilitators, it still has resources, so our continued military pressure is necessary to continue to go after that network,” said Votel to CNN, as reported by The Hill. In any event, achieving the top post in US Central Command (CENTCOM) is often seen as a boon for the careers of military officers. Former CENTCOM chiefs include retired generals David Petraeus and James Mattis, who would go on to become the head of the Central Intelligence Agency and US Secretary of Defense, respectively, after their stints as CENTCOM commanders. Former UK Ambassador to Syria Peter Ford tells Sputnik not to read too much into Votel’s comments but instead to observe the “continuing efforts of the media and political establishment to undermine Trump,” who has expressed far more anti-interventionist sentiments than his predecessor both during his campaign and while in office. The New York Times and CNN led media coverage last month of discussions among senior FBI officials in May 2017 of a possible national security investigation of President Donald Trump himself, on the premise that he may have acted as an agent of Russia. By reporting that Russia may have been able to suborn the president of the United States, these stories have added an even more extreme layer to the dominant national political narrative of a serious Russian threat to destroy U.S. democracy. An analysis of the FBI’s idea of Trump as possible Russian agent reveals, moreover, that it is based on a devious concept of “unwitting” service to Russian interests that can be traced back to former CIA director John O. Brennan. The FBI discussions that drove these stories could have led to the first known investigation of a U.S. president as a suspected national security risk. It ended only a few days after the deliberations among the senior FBI officials when on May 19, 2017, the Justice Department chose Robert Mueller, a former FBI director, to be special counsel. That put control over the Trump-Russia investigation into the hands of Mueller rather than the FBI. Peter Strzok, who led the bureau’s counter-espionage section, was, along with former FBI General Counsel James A. Baker, one of those involved in the May 2017 discussions about investigating Trump. Strzok initially joined Mueller’s team but was fired after a couple of months when text messages that he had written came to light exposing a deep animosity towards Trump that cast doubt over his impartiality. The other FBI officials behind the proposed investigation of Trump have also since left the FBI; either fired or retired. The entirety of what was said at the meetings of five or six senior FBI officials in the immediate aftermath of Trump’s firing of James Comey as FBI director on May 9, 2017, remains a mystery. The CNN and Times stories were based on transcripts either obtained or, in the case of the Times, on portions read to it, of private testimony given to the House Judiciary and Government Oversight and Reform committees last October by Baker, one of the participants in the discussions of Trump as a possible Russian agent. He thus made it clear that there was no actual evidence for the idea that he was acting on behalf of Russia. But the idea that Comey’s firing had triggered the FBI’s discussions had already been refuted by a text message that Strzok, who had been leading the FBI’s probe into the Trump campaign’s contacts with Russians, sent immediately after the firing to Lisa Page, then legal counsel to Andrew McCabe, formerly the bureau’s deputy director who was then acting director. “We need to open the case we’ve been waiting on now while Andy is acting,” Strzok wrote, referring to McCabe. As Page later confirmed to congressional investigators, according to the CNN story, Strzok’s message referred to their desire to launch an investigation into possible collusion between Trump and the Russians. Strzok’s message also makes clear he, and others intent on the investigation, were anxious to get McCabe to approve the proposed probe before Trump named someone less sympathetic to the project as the new FBI director. But the Times writers must have known that Bruce Ohr, former associate deputy attorney general, had already given McCabe, Page and Strzok information about Steele and his dossier that raised fundamental questions about its reliability. Ohr’s first contacts at FBI headquarters regarding Steele and his dossier came Aug. 3, 2016, with Page and her boss McCabe. Ohr later met with Strzok. Ohr said he told them that Steele’s work on the dossier had been financed by the Clinton campaign through the Perkins-Cole law firm. He also told them that Steele, in a July 30, 2016 meeting, told him he was “desperate that Donald Trump not get elected and was passionate about him not being president,” according to Ohr’s contemporaneous notes of the meeting. So, key figures in the discussion of Trump and Russia in May 2017 knew that Steele was acting out of both political and business motives to come up with sensational material. Strzok and Page may have started out as true believers in the idea that the Russians were using Trump campaign officials to manipulate Trump administration policy. However, by May 2017, Strzok had evidently concluded that there was no real evidence. Why, then, were Strzok, Page, McCabe and others so determined to launch an investigation of Trump at about the same time in May 2017? That description by anti-Trump law enforcement officials suggests that the proposed counter-intelligence investigation of Trump served as a means to maintain some leverage over his treatment of the FBI in regard to the Russia issue. That motivation would be consistent with the decision by McCabe on May 15, 2017 – a few days after the discussions in question among the senior FBI officials – to resume the bureau’s relationship with Steele. The FBI had hired Steele as a paid source when it had earlier launched its investigation of Trump campaign official’s contacts with Russians in July 2016. But it had suspended and then terminated the relationship over Steele’s unauthorized disclosure of the investigation to David Corn of Mother Jones magazine in October 2016. So, the decision to resume the relationship with Steele suggests that the group behind the new investigation were thinking of seizing an opportunity to take off the gloves against Trump. The discussion by senior FBI officials of a counter-intelligence investigation of Trump has become part of the political struggle over Trump mainly because of the stories in the Times and CNN. The role of the authors of those stories illustrates how corporate journalists casually embraced the ultimate conspiracy theory – that the president of the United States was acting as a Russian stooge. Goldman was evidently trying to sell the idea of Trump as a suspected agent of Russia. Goldman also gave an interview to The New Yorker’s Isaac Chotiner, in which the interviewer pressed him on the weakest point of the Trump-as-Russian-agent theory. “What would that look like if the President was an unwitting agent of a foreign power?” asked Chotiner. The idea that American citizens were somehow at risk of being led by an agent of the Russian government “wittingly or unwittingly” did not appear spontaneously. It had been pushed aggressively by former CIA Director John O. Brennan both during and after his role in pressing for the original investigation. When Brennan testified before the House Intelligence Committee in May 2017, he was asked whether he had intelligence indicating that anyone in the Trump campaign was “colluding with Moscow.” Instead of answering the question directly, Brennan said he knew from past experience that “the Russians try to suborn individuals, and they try get them to act on their behalf either wittingly or unwittingly.” And he recalled that he had left the government with “unresolved questions” about whether the Russians had been successful in doing so in regard to unidentified individuals in the case of the 2016 elections. The real purpose of that concept is to confer on national security officials and their media allies the power to cast suspicion on individuals on the basis of undesirable policy views of Russia rather than on any evidence of actual collaboration with the Russian government. The same logic – without explicit reference to the phrase — has been used to impugn the independence and loyalty of people who have contacts with Russia. It has also been used to portray some independent media as part of a supposedly all-powerful Russian media system. The revelation that it was turned against a sitting president, however briefly, is a warning signal that national security bureaucrats and their media allies are now moving more aggressively to delegitimize any opposition to the new Cold War. Gareth Porter is an independent investigative journalist and historian writing on U.S. national security policy. His latest book, “Manufactured Crisis: The Untold Story of the Iran Nuclear Scare,” was published in 2014. Follow him on Twitter: @GarethPorter. CNN was reporting the news verbatim from Obama’s mouth, repeating the phrase “moderate rebels” without the ironic quotation marks that have become necessary since. Obama’s assertion that the rebels offered the “best alternative to terrorists and a brutal dictator” was not questioned, unlike Trump’s continuation of the longstanding US policy of arming the Saudis.